You are here: Home / Nysus Solutions Blog/ What is M.E.S.? 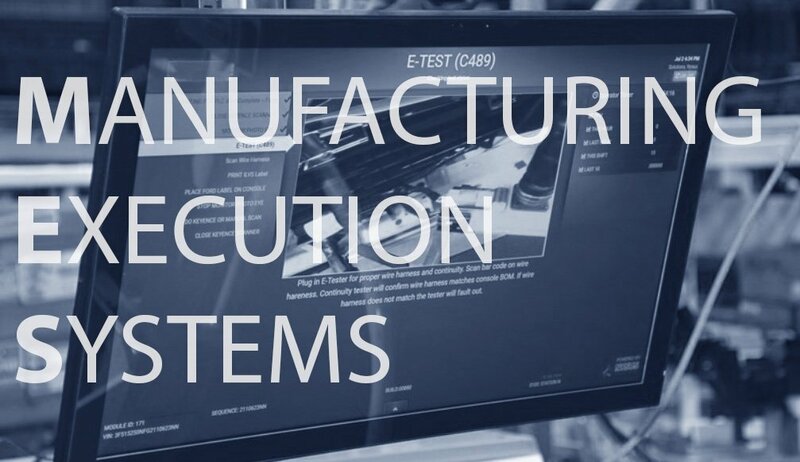 Manufacturing Execution Systems (MES) are computerized systems utilized in manufacturing settings to track and document the process of transforming raw materials (or components) to finished goods. MES gives feedback on a number of key factors from the shop floor to help manufacturers better understand their production lines and find areas of improvement. Regardless of industry or product, all manufacturing organizations must continually strive to improve operational efficiency in order to remain competitive. An effective Manufacturing Execution System is a critical tool which can facilitate rapid process improvements and ensure sustainability. The following outlines how a properly implemented manufacturing execution system can lead to reduced process costs, improved product quality, reductions in downtime, and ultimately, improvements in overall operational efficiency. Prior to the use of systems like MES, process feedback was generally obtained through manual entry of production data, and calculations of averages done through spreadsheets or by hand. While this gave operators a sense of what was occurring on the production line, mistakes were commonly made and data was not received in a timely manner. 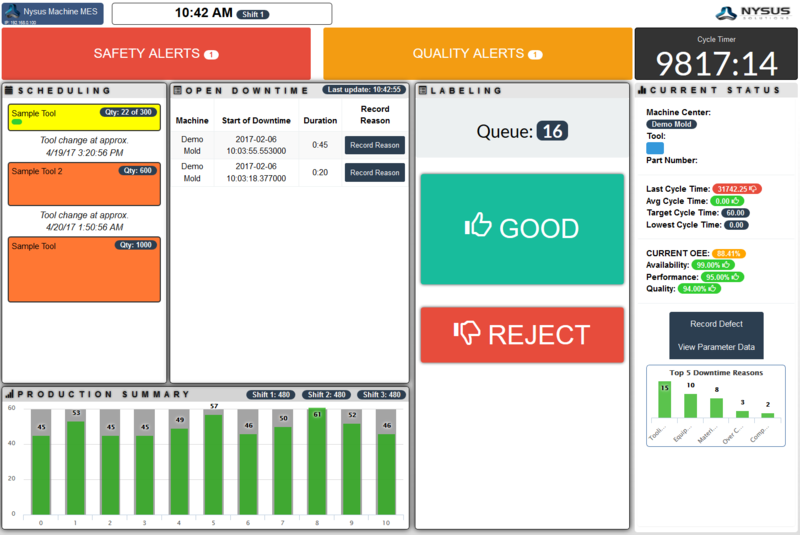 One of the main benefits of a properly implemented MES is real time process feedback. By presenting information as it is happening, corrections can be made before issues detract from performance. If a machine is not producing parts, everyone can instantly be aware by using a variety of feedback systems. Popular interfaces include shop floor dashboards, operator screens, email alerts and Andon systems. By addressing issues as they occur rather than after the fact, manufacturing operations can significantly reduce downtime. Quality related issues can also be reduced dramatically when defective product is recognized as it occurs. In many cases, defective products can be avoided altogether when the manufacturing execution system integration includes monitoring of process related parameters. When manufacturing professionals look to improve processes that are under performing, it is imperative that they have reliable data to guide them. A properly implemented manufacturing execution system can provide historical data including downtime reasons, quality issues, operator performance, cycle time variances and machine capabilities. Many OEMs require accurate historical record keeping from their suppliers in order to ensure that build processes are being completed correctly. Automotive manufacturers have developed new safety features with strict build instructions. The slightest mistake can reek havoc with recalls and wasted money on rebuilds. This historical information can provide insight to patterns that would not be obvious by simply reviewing a single data point. Accurate historical reporting can shape the road map for improvement opportunities. Anytime a defective product is produced, it not only wastes material and labor, but also consumes valuable process capacity. It is well documented that improvements to product quality can have a direct beneficial effect on overall process efficiency. Through automated work instruction integration, a manufacturing execution system can help ensure each step of the process is performed correctly and to required standards. Automated work instructions also provide the opportunity to eliminate paper instructions on the manufacturing floor; leading to improved revision control and ensuring that all associates are properly trained. Read more about reducing paper usage on your production line here. One of the easiest ways to improve overall operational efficiency is through positive incentives. By providing real time process feedback, associates can actively participate in obtaining efficiency goals. A manufacturing execution system can provide the “scoreboard” that all associates can rally around. Transversely, when there is an associate that is under performing, there is imperial data available to review with the associate. Often additional training or other assistance needs are identified through the review of this data. As detailed above, a properly integrated manufacturing execution system can provide improvements in all areas of operational efficiency including downtime, cycle times, product quality, and operator performance. In order to ensure a successful integration, it is critical to make sure a proper project scope has been defined. Items to consider include machines and control types, tools and equipment, process data to be collected and external systems that require data transfers. A thorough implementation plan can be the difference between a successful implementation and a system that does not provide any benefit at all. If your organization has a desire to make dramatic improvements to your operational efficiency, the implementation of a manufacturing execution system should be a top priority. As the pressures to improve continue to increase, it becomes imperative to utilize tools that will aid in your success. Learn more about Nysus Solutions Manufacturing Execution System here. Nysus Solutions also offers a subscription-based MES. Visit www.GuideMyWork.com to learn more! To discuss how Nysus Solutions’ manufacturing execution software and process automation can aid your manufacturing operation, contact us today.